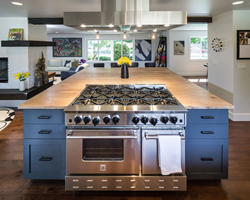 With our distinctive combination of restaurant-grade performance and unrivaled customization options, BlueStar offers trade professionals truly unique options for clients looking to create custom kitchens. BlueStar®, a leading manufacturer of high performance appliances for the home, today announced the six finalists in its first ever Kitchen Design Competition. The contest, which attracted entries from across the country, honors design professionals who incorporate BlueStar® products into innovative, beautiful kitchen designs. From day one, this client knew that a bright and sunny kitchen would be a reflection of her personality and lay the foundation of the design for her busy kosher kitchen. 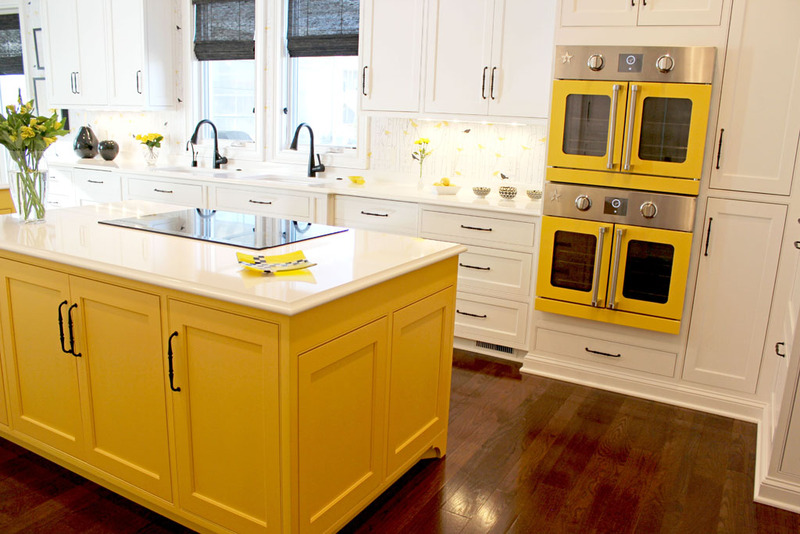 The desire was to showcase the visible appliances in a bold color that would literally adorn the kitchen and compliment the overall space. The BlueStar® 30" French door double ovens were selected for performance, design and the ability to custom color match the appliance to her kitchen island cabinetry. The stunning BlueStar® ovens take center stage as part of a design that is highly functional, fun and sophisticated. Removing an ill-placed powder room and inadequate pantry wall opened up the space but more importantly created the Baking Center the homeowner dreamed of. 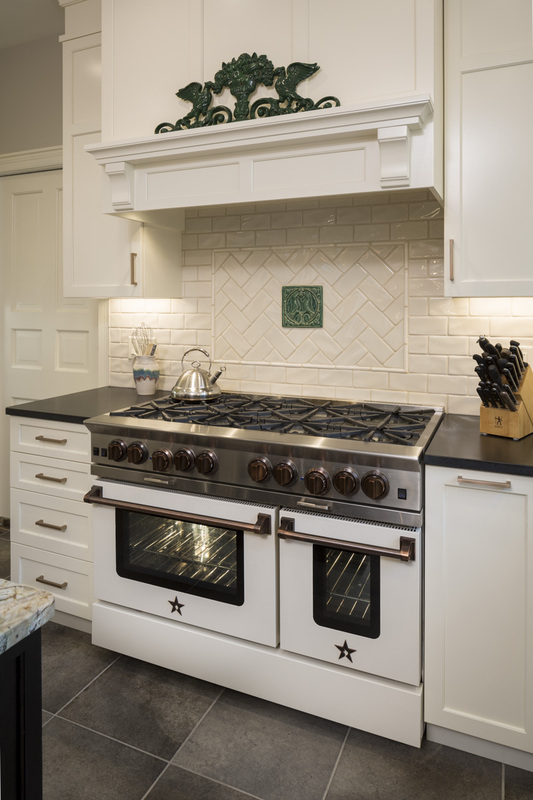 She requested Blue Star® and thus the designer used a 48" Platinum Range and a 30" Electric Wall Oven in a custom cream finish and antique copper accents. This not only provides the home baker the ability to create her specialties but also integrates with the Plain & Fancy Custom Cabinets in Buttercream finish. Black Absolute tops were brushed to mimic soapstone and the baking center and hutch have a complimenting yet durable Lagos Azul Quartz. The island top is honed Corteccia Quartzite bringing a flow of soft colors and joining the design together. Using an existing guesthouse footprint, the challenge was to provide a fun, usable and smartly designed kitchen that uses every inch of the small space without making it seem crowded. 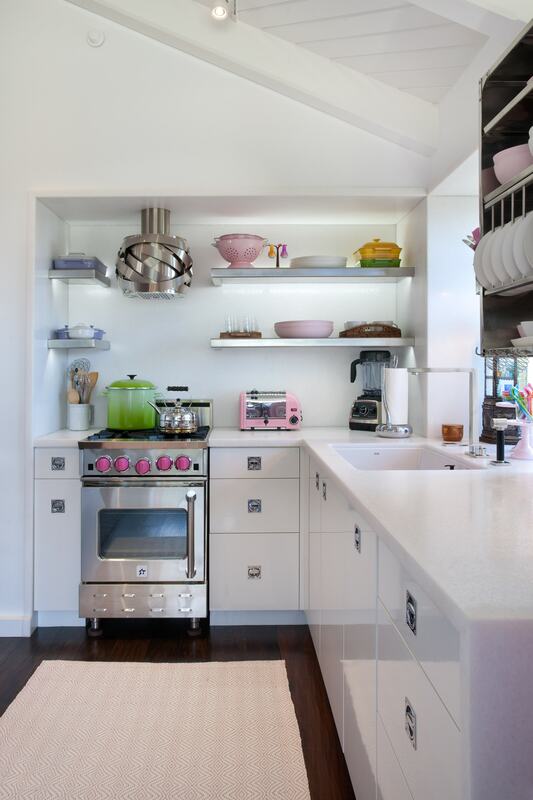 Counters, backsplash and window casing in crisp white veinless marble, stainless steel BlueStar® range with custom color knobs and stainless steel hood provide a backdrop for the owner's penchant for pops of color--specifically pinks! For more information, please visit http://www.bluestarcooking.com. Handcrafted in Reading, PA since 1880, BlueStar® cooking products are designed for discerning home chefs who demand restaurant-quality results in their own kitchens. 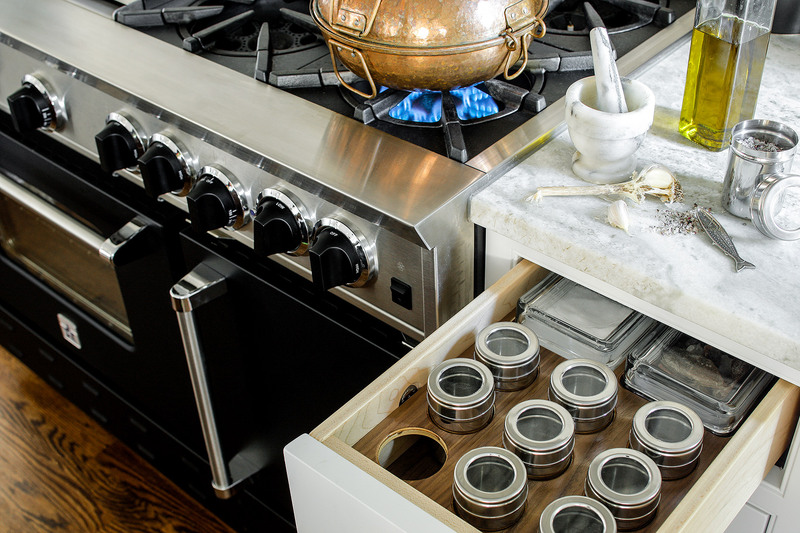 The BlueStar® product line features high-performance gas ranges, cooktops, wall ovens and hoods. 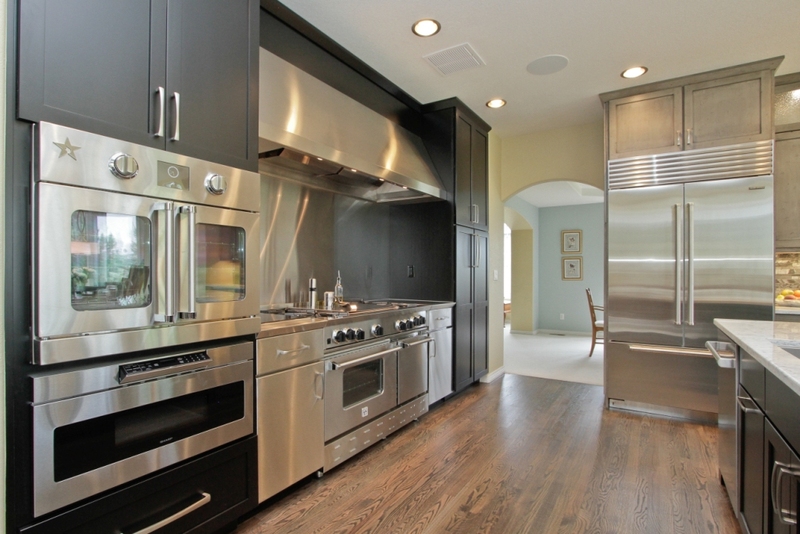 BlueStar’s unique performance features include an open gas burner system that produces up to 25,000 BTUs of cooking power, precise 130 degree simmer burners, and oversized convection ovens with professional-grade infrared broilers. Available in over 750+ colors and finishes, and with almost infinite configuration possibilities, BlueStar® premium cooking products offer virtually unlimited personalization options. For more information, please visit http://www.bluestarcooking.com.